Taylor High School Sophomore Michael Leleniewski is making quite the name for himself during the gaming season. Check out the article below. 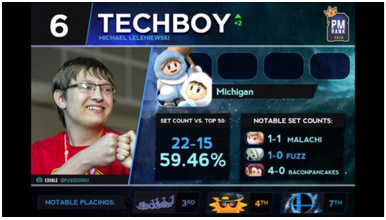 Young prodigy Michael “Techboy” Leleniewski surpassed all expectations in 2018 as he pushed his trademark Ice Climbers and intelligent play to new heights. Finishing off 2017 with a PMRank debut of #8, Techboy’s hunger for improvement persisted throughout 2018 - at only 16 years old, he’s found himself in top 8 of every single event he attended in 2018. Techboy’s weakest placement came at the start of the year. He placed seventh at East Coast major We Tech Those 3, where Malachi and Switch both dealt him resounding 3-0 losses. But it speaks to his consistency that a top 8 finish at a prestigious national is Techboy's "weakest" result. Only two months later, he struck back with his first major win at Frozen Phoenix 2018 in March. Techboy tore through bracket on his way to winners’ side of Grand Finals after scoring wins on players such as MorKs, Sylarius, Ripple, and up-and-coming Canadian star Rongunshu. Though Rongunshu returned and reset the bracket with his lethal Lucario, Tech responded immediately with a 3-0 and a handshake to take home first place. Techboy’s avalanche of momentum continued into the summer. At Smash N Splash 4, Techboy was able to defeat the likes of Wyld and BaconPancakes on his way to slaying his former demon, Malachi, in a 3-0 so stunning that it looked as if Ice Climbers had an advantage against Peach. While Tech would once again finish at seventh after losing a tense set to Sothe, his run at SNS4 cemented his status as one of the very best going into 2018. At The Even Bigger Balc, Techboy defeated Fuzz 3-1 in their first tournament set, following up with a 3-1 win over BaconPancakes before falling to Blank for fourth place. In the later part of the year, Techboy continued to have incredible results, winning Plus Ultra while dropping only a single game the entire time. He triumphed over stiff competition such as Connor, Morsecode762, BaconPancakes (the winner of that one dropped game) and Envy. Notably, his set against Envy was a revenge match for Techboy’s loss at Project M Showdown 7. Techboy followed up on this excellent performance at Evicted, taking sets off players such as n0ne, Dirtboy and Morsecode762 in a winners’ side run to Grand Finals. Morse ended up coming back to win the event, and Techboy took home second place. He finished off the year with a third place finish at Blacklisted 4, powering through players such as Bongo, Twisty, and Envy. His only losses were to Wolf mains Switch, his one consistent roadblock, and Filthy Casual, who played out of his mind on that day. Boasting a slew of great results, a well-travelled resume, and a high degree of consistency, Techboy’s rise on this edition of PMRank is well warranted. As the Michigan maverick continues his eye-catching improvement and sharpens his mastery of an unconventional character, the world begs to see just how far he can climb.